Man Man in Montreal or Quebec City? Inform me about the next events for Man Man. Enroll yourself to our priority waiting list for Man Man to be alerted when new tickets are available. Filling this form doesn't engage you to any purchase. Man Man is coming to Cabaret Mile-End, in Montreal, on May 27th, 2011. Man Man's new album Life Fantastic, will be released on May 10th, 2011. 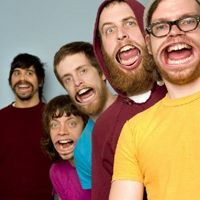 Known for their exuberant live shows, Man Man is made of Honus Honus, Pow Pow, Chang Wang, Turkey Moth and Jefferson.